Summary: In this utterly charming debut—perfect for fans of Cecelia Ahern’s P.S., I Love You and Allison Winn Scotch’s Time of My Life—one woman sets out to complete her old list of childhood goals, and finds that her lifelong dreams lead her down a path she never expects. I packed a ton of books for my vacation to the beach a few weeks back including THE LIFE LIST by Lori Nelson Spielman. It actually ended up being the first book I decided to read. Maybe it was the cover -- it definitely looks like a girly read; however, I think it had more to do with the description. THE LIFE LIST had the possibility to be one of those feel-good books that is perfect for a summer read. And I have to say that I really enjoyed THE LIFE LIST -- probably even more than I was expecting. THE LIFE LIST is about Brett Bohlinger, a 34 year-old woman who has a "perfect" life. She has a great job at her mother's cosmetic company, a terrific boyfriend, and a great apartment; however, when her mother dies, everything in her life changes in a second. Instead of taking over for her mother at the cosmetic company, Brett discovers that her mother has left some unusual requests in her will. Brett must complete the life list that she created when she was fourteen! Brett is extremely confused by her mother's request -- she is nothing like the girl she was at fourteen; and some of the requests make absolutely no sense like having a relationship with her father... who passed away years ago. However, she decides to do her best to fulfill her mother's wishes. As she crosses off each item on the list, Brett manages to learn some very important things about herself; and she just might find the happiness that has eluded her along the way! THE LIFE LIST is a delightful coming-of-age story about a woman who doesn't even know what she's been missing. She seemingly has it all; however, she learns that she hasn't been living the "right" life and she got lost somewhere in the last twenty years. Evidently, Brett's mother did know best (and maybe even knew Brett better than Brett knew herself) because she wanted her daughter to revisit her old, teenage dreams; and she was wise enough to leave her daughter with this one last demand. I am pretty sure that one of the main reasons I enjoyed THE LIFE LIST so much was the character of Brett. Of course, my heart went out to her because she lost her mom way too early, but I also felt horrible that she had to jump through what seemed like some pretty crazy hoops to get her inheritance. Some of the requests I understood like "fall in love" or "have a child." However, some were pretty out there like "get a horse!" Now, that's a 14 year old's dream is I've ever heard one.. or is it? I really enjoyed following Brett along on her journey and seeing how much she changed. Brett's story was both funny and heartbreaking, and I loved how this novel had so many wonderful messages about living and happiness. In addition, I think this novel really resonated with me because I am a mother. Not only did I love how wise Brett's mother was, but I also appreciated seeing Brett's life list at 14 because I now have a 14 year old daughter. THE LIFE LIST made me really examine my old desires as well as my current ones, and it also made me wonder what direction my daughter's life will take! Needless to say, I am going to recommend THE LIFE LIST for book clubs... and especially mother/daughter ones. There truly is a lot to discuss about Brett's life, but I also loved that this book made me think about my own life... and my own life list. There is a reading guide available with twelve terrific questions. Some of the themes you might want to explore include family, heredity, forgiveness, acceptance, second chances, parent/child relationships, love, courage, strength, and happiness. You might even want to have your members create their own life lists and discuss! 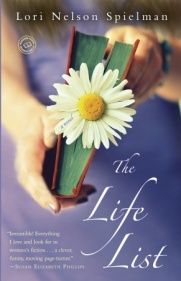 I really enjoyed THE LIFE LIST and I think it's a wonderful book for women of all ages. Highly recommended! I think many women "lose" themselves when they become wives and/or mothers so I really like the message of this book. It sounds terrific! This does sound like a good book club choice. I agree with what Kathy said. I'd like to read this! I love what-if, should-only stories, and I've read 2 books by Allison Winn Scotch. Thanks for giving us the heads up about this title. Thank you so much for this wonderful review of The Life List. And thanks for leaving such nice comments, Bermudaonion, Beth F, Beth Hoffman, and Rita_h! Much appreciated!